This article explores the research on how flooding due to sea level rise will impact California in the coming decades. Coastal residents of California are well aware of the increasing threat of sea level rise. Along the coast, property is susceptible to erosion, which translates to the loss of property. But residents of low-lying areas a distance inland from the ocean also need to be informed of the coming risks of flooding due to a rising sea level. In the years to come, what residents have come to expect as minor floods will become major floods. For an example of the worst (and fairly likely) case scenario, recall the massive flooding that occurred in New Orleans during Hurricane Katrina, a situation that residents theoretically knew might happen, but for which they were still disastrously underprepared. Globally, sea levels are expected to rise 3-9 inches by the year 2030, compared to sea levels in 2000. But the pace is quicker in California, where the sea level is anticipated to rise up to 12 inches in the same time period. Sea level rise happens at different rates across the world. Areas with warming waters, like California, will see a higher rise. Seasonal weather patterns like El Niño contribute to differences in sea level, too. Further, California’s fault lines are actually causing land to dip relative to sea level each year. 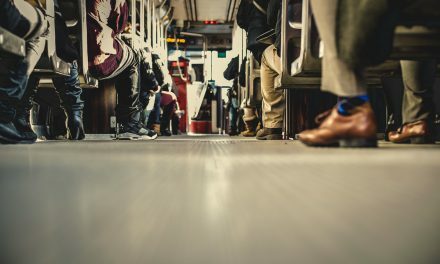 The next large earthquake of magnitude 8 or greater is expected to cause a sudden land drop, paired with a sea level rise of 3-7 feet, according to the National Academies of Science, Engineering, and Medicine. Other, more common sudden rises will occur when large storms hit California, which are often worse during El Niño years. Warming seas will likely create larger storms in the future, and more flooding. It’s these rapid increases in sea level that California residents need to be concerned about, since these will potentially cause flooding in low-lying areas even miles inland from the coast. Since 1900, the Bay Area has experienced a moderate eight-inch rise in sea level. 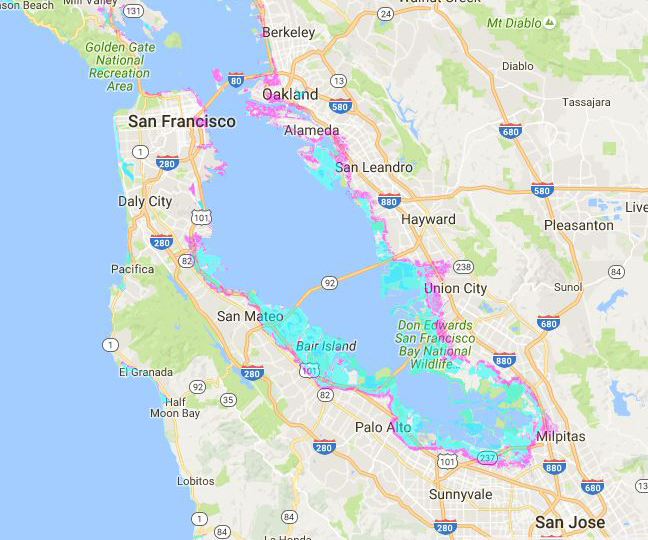 By 2100, scientists expect sea level to have increased at minimum three-to-five-and-a-half feet in the Bay Area, according to the State of California Ocean Protection Council. Image courtesy the Pacific Institute. Blue areas are current areas at risk of flooding. 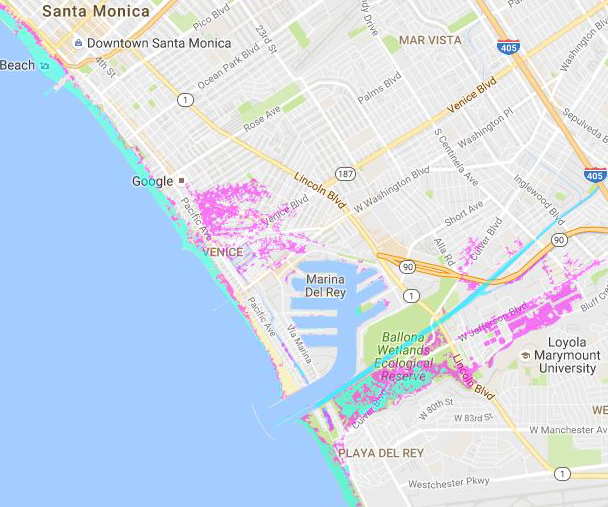 Pink areas are the areas at risk with a four-foot sea level rise. Economic centers like the San Francisco airport will be increasingly prone to flooding as sea levels rise. The Pacific Institute estimates the economic impact of flooding in San Francisco at $4.9 billion (not adjusted for inflation from the year 2000). Damage in nearby San Mateo from flooding may surge as high as $24 billion, and $15 billion in Alameda. The coast near Monterey Bay is also at risk of flooding. Flooding in low-lying Salinas has the potential to destroy homes and farmland, costing over $2 billion in property damage, though the total economic cost will likely be even higher when accounting for the loss in agricultural activity. The coastal area south of Monterey and north of Pismo Beach won’t be much impacted by flooding in the coming years, mostly due to the high cliffs that line the coast. However, these cliffs are susceptible to other types of damage from sea level rise, notably erosion and landslides. 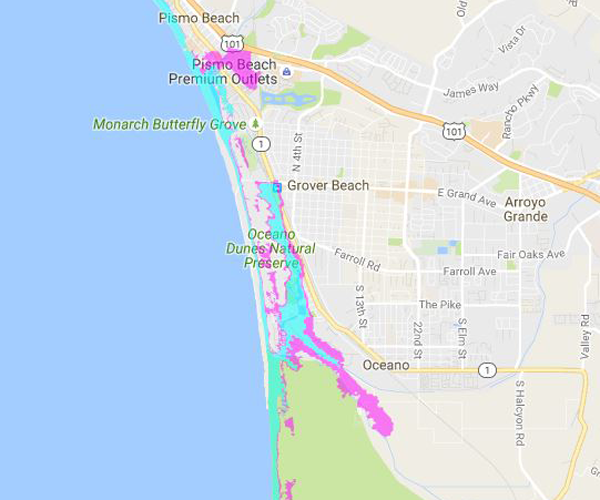 Sea level rise will increase the amount of land in Pismo Beach susceptible to major flooding 13% by the year 2050, according to the City of Pismo Beach. In addition to the loss of property, freshwater wells may become permanently inundated with saltwater, which will harm an already dwindling water supply. Santa Barbara estimates around 55 inches, or five-and-a-half feet of sea level rise by the year 2100. The economic effect of flooding is expected to reach up to $1.1 billion in Santa Barbara, according to the Pacific Institute. 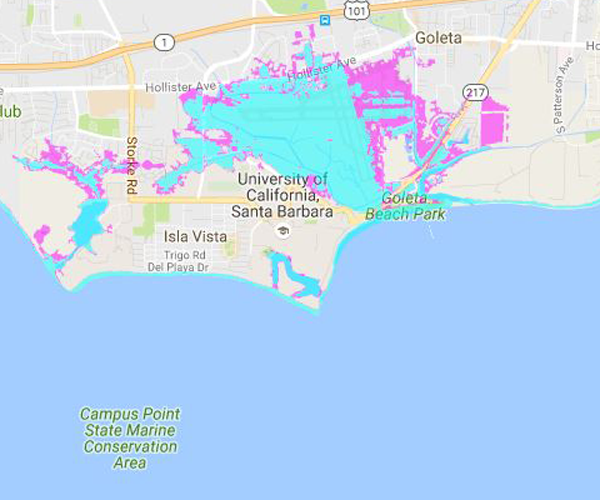 The California Energy Commission forecasts Santa Barbara will face a moderate risk of flooding in the year 2050. This will worsen each year, and by 2100 the city will face a very high risk of flooding. 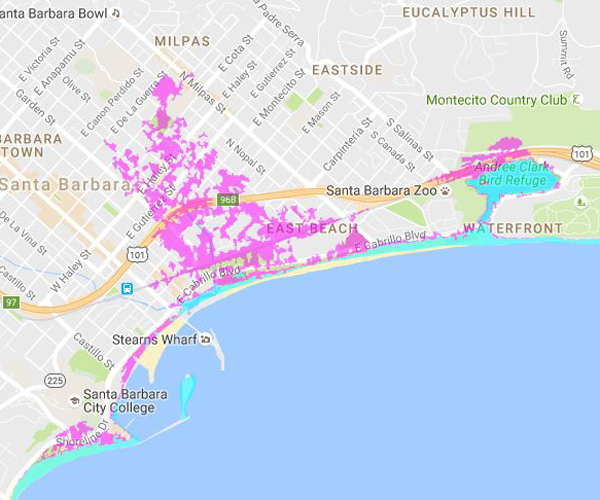 The current choices facing Santa Barbara including adapting by building seawalls and other barriers, or abandoning the coast and other low-lying areas to the flooding very likely to occur in the coming decades. Many of Santa Barbara’s storm drains empty out onto the beach. During strong storms when waves are high — to be worsened by sea level rise and warming oceans — these storm drains become clogged by seawater, resulting in flooding far inland from the coast. 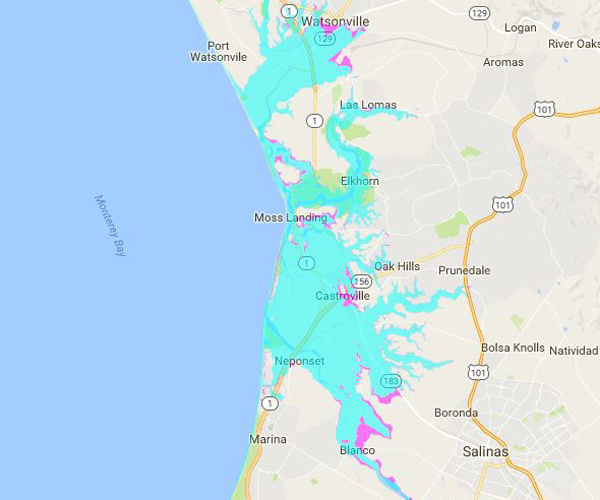 Coastal Resilience Ventura observes vulnerable populations like low-income, the elderly and very young will be most impacted by future flooding in Ventura due to sea level rise in the coming decades. At today’s population density, 16,000 people reside in these flood-prone areas. Ventura County also supports agricultural activity, and 10% of residents rely on income directly or indirectly related to this industry. 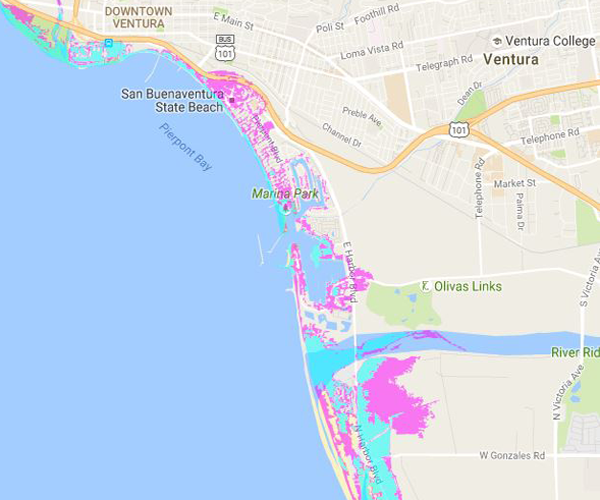 Coastal Resilience Ventura identifies some farmland that will be susceptible to flooding, but much more will be affected by saltwater inundation of groundwater, which will be worsened when sea levels rise. A study by the University of Southern California (USC) observes sea level rise will impact Santa Monica’s large tourism industry, which relies on its wide, sandy beaches. Likewise, beaches along the Pacific Coast Highway will need to be shored up to prevent flooding of the highway during storms. The Port of Los Angeles, seen in the map above, receives 40% of all U.S. imports, according to the USC study. 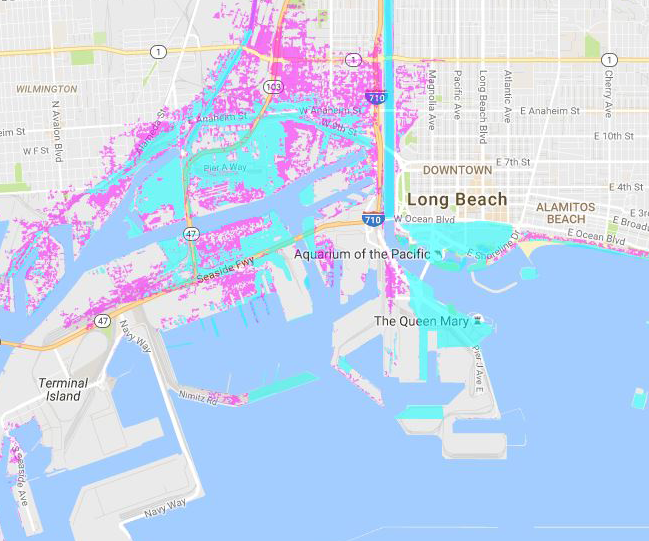 The port is currently susceptible to flooding during storm surges, but the impact will only worsen in future years as sea level rises. The port is well aware of the danger and is pursuing ways to strengthen its barriers. But the entire city will need to be prepared, since roads leading to and from the port will need to be accessible for ground transport to carry goods inland following storm surges. 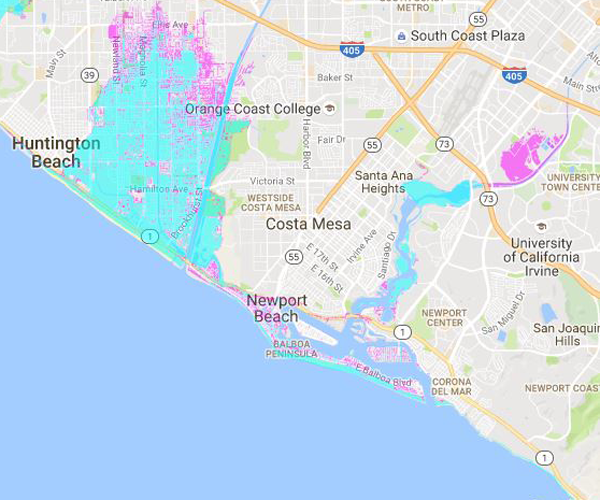 Flooding due to sea level rise will potentially cost residents $17 billion in Orange County, according to the Pacific Institute. 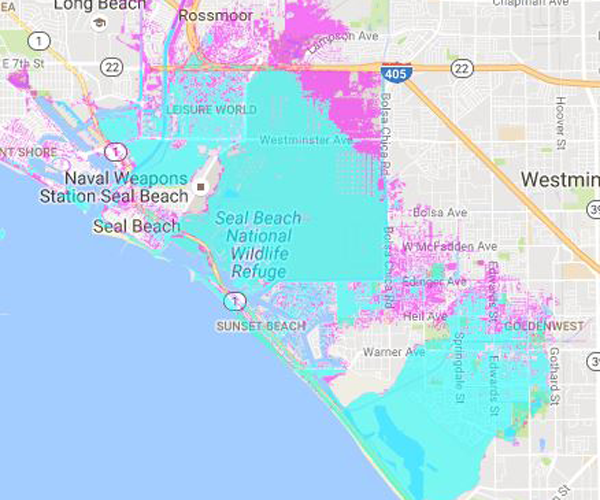 A report in the New York Times estimates Huntington Beach will be 27% flooded by the year 2100 if no progress is made to halt sea level rise. 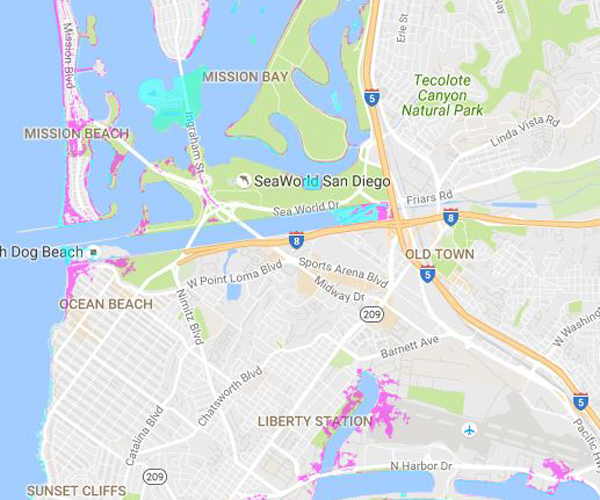 San Diego is in much better shape than other Southern California cities, as sea level rise is likely to cause just minor flooding in the coming decades. 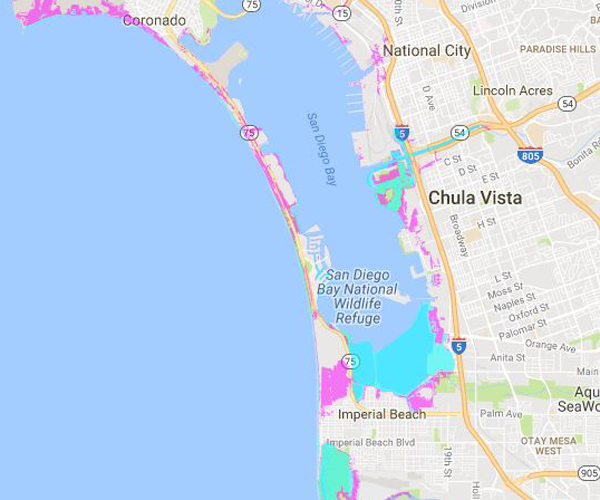 In total, a major flood due to sea level rise will cause up to $2 billion in damage in San Diego County, according to the Pacific Institute. 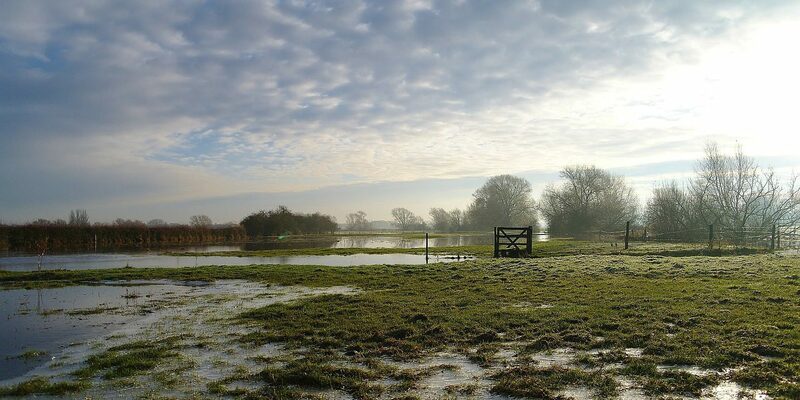 Very few residents are at risk of flooding by the year 2050. But by 2100, more residences will be under threat from a large flood. The San Diego Airport will also be under threat from flooding, according to the San Diego Foundation. Californians need to decide: abandon the coasts? Or build barriers to protect residents and economic activity in densely populated areas like Los Angeles and the Bay Area? Of course, abandoning the coasts entirely is out of the question. 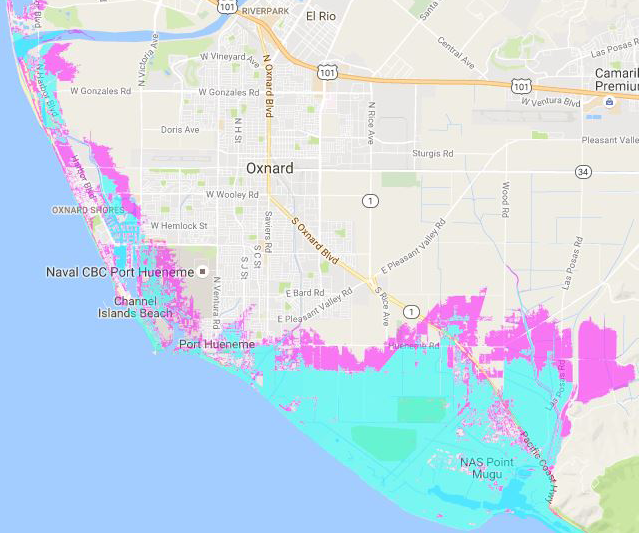 But estimates for not preparing for sea level rise range from four to ten times the cost of simply installing proper barriers and taking mitigation efforts to lessen the impact of flooding, according to the Orange County Register. Residents living on or just above sea level need to be aware of the future risks, which will only increase as seas rise. That’s not to say they ought to move or relocate to higher ground. But they need to prepare for the eventuality of future flooding, including the probable impact on home values in flood prone areas, which they need to consider in negotiating today’s price. Likewise, private property owners on the coast may need to invest in barriers against flooding, like seawalls. Residents of the city can also prepare for future tax increases to pay for the mitigation and prevention costs associated with sea level rise as local government make preparations. These preparations are already in the works, as most local coastal cities have commissioned reports on the likely impact of sea level rise and flooding in their communities. This thread shows what a “mell of a hess” we are in as a nation. Here’s the thing: No matter what you THINK or DENY on this topic — this site is about helping you keep out of court. Don’t be a fool and “deny” that water/sea levels can and have risen (now and in the past), not inform your clients, cause them irreparable harm. and be surprised to have your pants sued off. I am as political as the theoretical next person — maybe more so — but this is not the proper place for a discussion on the presidential race. And, nowhere on the web, is it appropriate to be write to people you don’t even know in such a disrespectful, base manner. The article states sea and ocean levels are rising, however just last read an article by scientist SAID that ocean levels as measured by latest equipment by satellite actually decreased a fraction ?? ?, and were scratching their heads to why so?? I read that the North Pole is shrinking, but the South Pole is rapidly expanding, so that negates the fears in this article. The global warming scam has put a lot of misinformation out there. Scientists are still pressured to agree with the scam to get their federal funding. The planet is very good at balancing the CO2 and Oxygen levels as well as temperature levels. If these people didn’t come up with a doomsday scenario then who would need them. 84 years is nothing in the life of the planet, so we won’t see enough in that time period to notice anything. When the article states the ocean rise between 1900 and now I have to laugh. In 1900 someone put a stick in the ocean with a mark on it – lol. When we get invaded by Martians then we will have something to worry about. What a bunch of BS. They claim that from 1900 – 2016 the sea level in the SF Bay area rose by 8 inches – but by 2100 it will go up another 3 – 5.5 feet more. I wonder if they even considered the possibility that the sea level didn’t rise, but the land mass may have subsided instead in that local area. 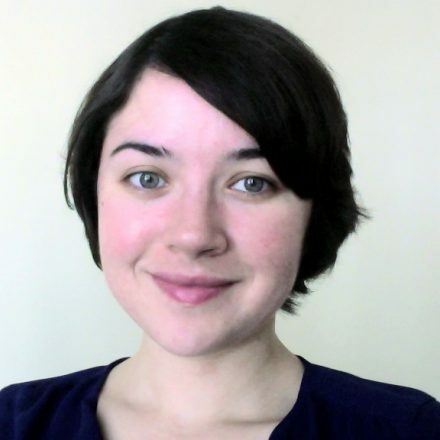 The computer models that the alarmists rely on have been shown to be flawed and exaggerate any possible outcome into a catastrophe that won’t be happening. Ask Al Gore how he made over $100 million preaching about global warming that has been proven to be a fraud. Did P.T. Barnum really say there’s a fool born every minute? Maybe not, but Al Gore proved that statement is correct. You do realize, don’t you, that subsidence would leave unambiguous telltale signs. Or, maybe you do not believe hat those signs appear to everyone? So let me tell you there has been no subsidence to the scale it would need for the preceding rise in seal level. You may be a troll, sent here by flat-earthers to harangue and harass people assessing the science here. Or, you may just be stupid. I thinks it’s the later. I’m a denier but you’re a fool. Haha. Climate change encompasses far more than global warming…. that’s why the usage changed. One could say that global warming drives climate change. From today’s Guardian: “Recent fires have claimed hundreds of homes and killed eight people in California – an ominous record because traditional fire season starts only in autumn with the arrival of hot Santa Ana winds. It’s part of a trend of drier winters, warmer springs and hotter summers. Climate change has extended the west’s traditional fire season by 78 days since the 1970s, running from June to October. Fires start earlier and burn longer. You people act like one century of temperature records are all that one needs in order to determine long term weather patterns. Are you even aware of the age of the planet? I came to CA in 1970 and in July the east county (El Cajon) was burning everywhere. What has changed is the forest service. They used to do control burns to create fire breaks and get rid of fuel until a fire got away and burned down houses. They stopped the control burns and now the fuel is everywhere – that is why the fires are worse. Global warming is a total scam – they used federal grant money as the incentive to get scientists to put out false information. The goal was a global energy tax – huge money going to the IMF. We’ve heard about cows farting, etc creating so much CO2 it was going to end the world, but you never heard about Coke and Pepsi soft drinks releasing CO2 every day by the millions of cans – why? Because those corps would have an incentive to get to the truth. Global warming is made up. There is no global warming except of the natural variation in the Earth’s cycles. I am sure the Antartic ice melt is the result of the El Cajon Fire, cows farting and coke can opening. In order for the temperature to rise 1 degree, the release carbon dioxide from those items would have to be multiplied close to 100000000 times. But lets do some math there are about 2 billion cows on earth, but close to 9 billion people, if you fed every body on earth, taco bell bean burittos for a month, you would still not release more C02 than all the cows combined for 10 years. We fart and release far more metthane and Co2 that cows ever will. If you were to open EVERY CAN of soda pop made in the US this year, and let everyone of those go flat and release most of the C02, it would account for about .0009 percent of the C02 release every year on earth. people who deny the science presented are more influenced by politicians who have an agenda, that agenda is to protect those industries that would be affected by adopting laws and regulations that would hurt them financially but would decrease the rate of climate change. This is why these industries give millions of dollars each year to writing articles with no scientific merit or peer review, to tell people climate change is not real. All this is easier for people to believe than to do the math and figure it out for yourself. its is very.very obvious. I love the fact that there are so many suckers out there who don’t believe in global warming. It means there will be buyers for our properties in Florida and in the CA flooding zones specified in this great article. 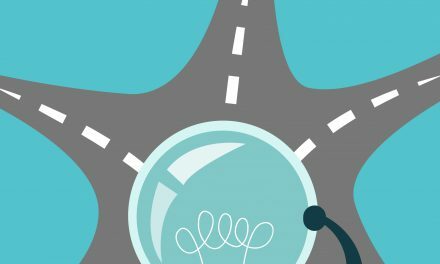 Recommend selling your homes in these low lying areas before the suckers wake up. Please explain why the global warming crowd changed the name of it’s scam to climate change. Next, if warming is so bad, please explain why some of the most prosperous times for humans on this planet occurred during times of warming. Lastly, if warming is so bad, please tell us the optimum temperature for the planet . Thanks. Who cares….sell em!! If we are so smart to actually believe in global warming…. it’s a hoax..
Carrie Reyes, you wrote facts sweetheart. That’s the problem the science deniers commenting on your article are having: They don’t like facts that upset their beliefs. There should be a basic IQ test to get a real estate license. Jason, clearly you are voting for Hillary. Any writer can say anything and if you’ve been watching the news you would see more lies and propaganda than ever before. She did not give any facts. A fact is something that is undeniably true. Everything she gave us was conjecture. If you are in the RE business you better get E&O ins. because you will need it if you don’t know how to recognize facts from opinions. I guess you missed the news about the scientists giving bogus statements, so they would not lose their federal funding for all their other projects. All those “facts” of yours went south leaving you with egg on your face. And I am a licensed broker who is a liar denier. Real science either gives us theories or facts. I was very disappointed at how easy it was for the federal gov to get scientists to give out false information. The big money people always seem to get what they want. As illustrated by the science-denier’s comments here, real estate agents, as a group of so-called professionals, are some of the dumbest people I’ve ever met. More motivated by their fearful politics than intelligence. Maybe you should stop hanging around with like minded democrats. Sounds like a lot of scared people to me. Oh, no, their income might drop! “Show the other side” — right, and don’t say the earth is round, because that’s a govt. plot, too, must give equal time to the flat-earthers…. Why is a Real Estate education, who know nothing about global warming, cherry picking opinions without presenting the opposite opinion. Maybe we could use the water to flush out the Salton Sea . . . .
It’s going to happen. Doing nothing is bad public policy. We need to divert funds to address the flooding problem instead of spending it on overly expensive projects like high speed rail (billet train) and the massive state water project in the Sacramento-San Joaquin Delta. I just came back from Alaska and did a lot of traveling thought the Southern portion. Don’the know how we could rise so many inches when there isn’t enough to snow or ice to melt to change oceans that much. If our species where a billion years old we would have seen these changes time and time again. “Globally, sea levels are expected to rise 3-9 inches by the year 2030, compared to sea levels in 2000. But the pace is quicker in California, where the sea level is anticipated to rise up to 12 inches in the same time period.” Hardly expected to see idiotic conjecture in “firsttuesday”, didn’t anyone read this tripe before putting it online ? 3-9 inches by 2030 hahahahahah. question for the all seeing knowing miss reyes. if i pay for continuing ed classes BUT global warming errr cooling err climate change events preclude my use thereof, will 1st tuesday give me a refund? The government creates a problem (like the housing bubble) and then solves the problem (Frank / Dodd Financial Reform), so that you will become completely dependant on them. Global warming is a device to scare people, that only the government can solve with globalization. When you are completely dependant you will no longer be free, and the social engineers will have you by your short hairs. Wake up and have your public servants do their jobs, not scare you into slavery. You are correct! But seriously, our politicians would never lie to us would they? lol Hillary Obama Bush can’t tell the truth. This is again BS from the global warming alarmists. I just don’t understand why First Tuesday is joining in. There is no science to prove any of this and the only “scientists” who say there is are on the payroll of organizations that propagate this kind of ideology. All of these “what-if” scenarios are pointless and wasted time. None of their past “predictions” ever came to be. That is why it is no longer Global Warming but Climate Change. Look at the facts and look at history – there is no warming. Earth’s climate has always be “changing” so climate change is over-hyped and nothing new – climate has always been changing and we can’t change that. We’d be better served to focus of things that actually matter than on reading this propaganda. You nailed it Sergey. It was all a scam for a global energy tax. I think you were the person who sat at the back of the class and read comic books when you had science class, or later cut school. Most likely you are not well read and have a high school education or mavbe even graduated from a JC. Congrats. Now you have the knowledge and skill levels to tell not dozens or hundred or even thousands, but 10’s of thousand scientist with Phd’s, that they are all wrong. Or maybe your whole education came from watching Fox News. I am forewarned. I lived in Playa del Rey in the 70’s, never saw a flood there until this past tear. Now I am aware of the posted signs guiding us to evacuation routes in case of tsunamis. Three cheers for the government doing something right in advance for a change! Tsunamis are possible, so your local government did a good thing, but they are caused by under water ocean earthquakes, not sea level change. Now, just because you have not had a flood since 1970 does not mean the sea level is higher – that is bad logic and only 1 of many possibilities. 20 years ago there were waves crashing through a coastal restaurant and that has not happened since, so one could say the sea level went down, but that also would not be logical. Of course if you lived in Playa del Rey about 50,000 years ago and experienced the ice age, where ice sheets covered most of North America down to Central California and even lower, you would have noticed you could walk to with 3 miles of Catalina Island. there was no land bridge, there was still an small open water separation, but evidence of Mammoth on the island, who were not able to swim 26-40 miles across a deep ocean To Santa Rosa or Catalina Island but could for 3 miles, means that warmer temps will increase that distance becasue the ocean will rise a few feet along the So cal coastline and the Catalina Coast line. Oh. and this rise will be permanent. So now is your chance to but oceanfront property in Baldwin Hills and higher ground inland. Denial won’t stop the flooding. Look up how sea levels have already risen (and no, I won’t do your homework for you – you look up the facts). Oh, and there is such a thing as facts. Sea level is already rising and as the Antartic shelfs fall into the ocean they will rise even higher. Don’t let ignorant deniers trap you in your flooded home. Fact: sea levels have risen numerous times in the past. Fact: sea levels have also dropped. Fact: climate changes because this is what climate does. In fact if climate didn’t change the earth would perish. Oh, and just because sea levels are rising at a certain rate at a certain point in time does not mean that they will continue to rise at that rate infinitely. Lastly, if someone gets trapped in a home by sea levels that are rising a couple of inches annually, it would seem that they would the ones to blame, not those who laugh at your alarmist mentality. I just read that the Antartic is rapidly expanding as the North pole is shrinking and it is due to the wobble of the Earth’s axis. What a lot of unfounded nonsense. Who is paying you to run this kind of biased gibberish – Al Gore? A remarkably quick way to lose credibility. You lost it with me! This article is a load of crap! The Earth is not warming but it is in a long term cooling trend. The sea level is not going to rise! Baloney! How about the glass is half full: We need more fresh water, recreational areas and wildlife habitat. So instead of continuing this negativity about rising waters–if this does happen–this is what we should do: find inland areas that are suitable for building a reservoir. Employ workers with “shovel ready” jobs to build a pipeline from the “rising” ocean to the inland reservoirs. Pump the “extra” salt water into these lakes. Build (more “shovel ready” jobs) a desalinization plant at each reservoir to convert some of the salt water to fresh water to be used by local communities. The result: more jobs, more fresh water, less saltwater and rising seas, more wildlife habitat and best of all more recreation area so we can decompress from ridiculous assertions like the ocean is rising. This is what is wrong with America, we have too many politicians who make money off of avoiding solutions that work for all of us–cause they are in it for themselves! Did you even go to school, or did you sleep through science class. 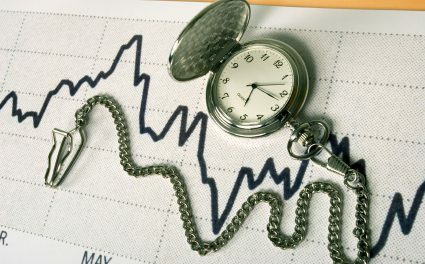 The evidence there is a rising change in the climate of the earth is very real and agreed to by about 99 percent of the credible scientific community, the only thing at issue, is how fast is the temp rising, how fast the ice is melting and how much time we have until the change is irreversible. Its politicians, who are getting tons of money from special interests, like the gas and oil industry whose products release the most carbon dioxide into the atmosphere that causes the speed up of warming. they stand to loose Billions and Trillions in the next few decades should the governments adopt better standards. You need to stop watching Fox news so much, It make you seem dumber than you already are.